Does that name sound at all familiar? If not, then I’m so happy to be able to introduce you to this fantastic sock designer! 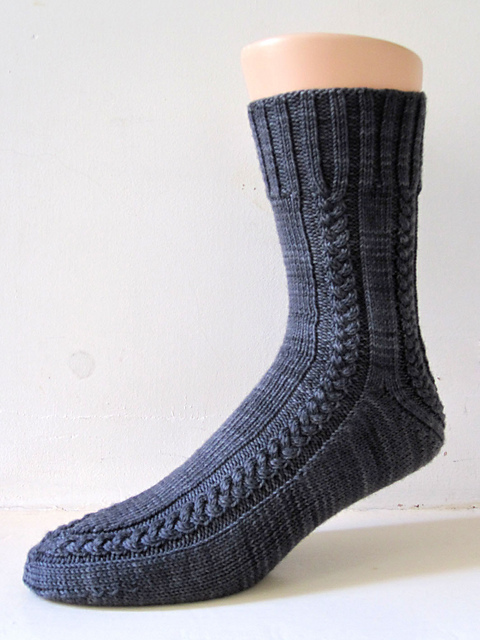 A while back I was browsing Ravelry for some Sock patterns and I found this amazing designer that has a lot of gorgeous sock patterns and they are all FREE! I really admire his work and he does both colourwork and patterned/cabled designs and also has a few socks with innovative or unusual construction. So far I have not had the pleasure of knitting one of his socks but since I’m looking for a new sock to knit (yes I know, What a surprise! ), I’m going to choose one of his designs. Actually, I think I’ll choose 2 because I have my latest Knitcircus Gradient Yarn Sock Club yarn waiting and then there is the upcoming show in London and I really can’t be seen there knitting with a yarn that is not mine 🙂 So as for the socks using my own yarn, I’m thinking of using a sock blank that I have dyed. This is a sparkle sock blank, 75% super wash merino, 20% nylon and 5% silver stellina. This is a yarn that I adore! I love the sparkle and it is just so super soft and wonderfully comfortable for next to skin wear be it for socks or any other accessory. I just recently got theses sparkle sock blanks so this will be my first time knitting with one of those although I’m very familiar with the yarn itself. 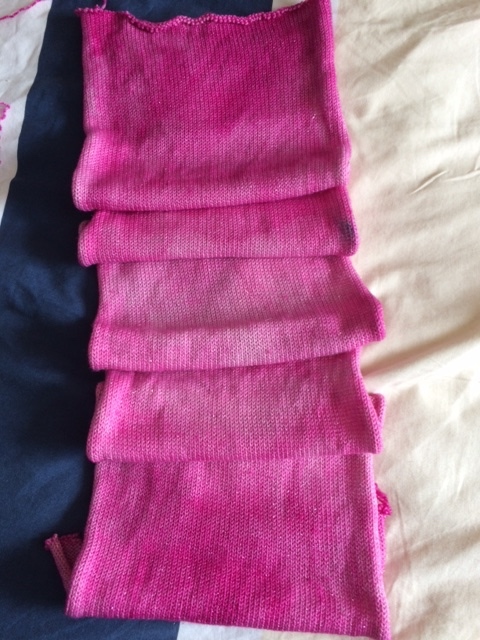 I dyed this with a new method of kettle dyeing where I left parts of the blank in the simmering dye pot for different lengths of time which in turn gives me a blank with different tones of fuchsia which I quite like. I did dye a few of these and will be selling them at the I Knit Fandango Show this week (May 15th and 16th) in London. And here’s a picture of the sock I love the “braid/cable” design on the side. As this particular blank is knit in single, it means that I will not be able to do a TAAT knit but as I have chosen a detailed pattern that is maybe for the better. LOL! When I read ‘Does that name sound familiar?’ General Hogbuff immediately made me think of Dukes of Hazard – if you’re too young, their car was the General Lee and their adversary Boss Hog. Oh dear! Will go check out the patterns and rest my poor crazy brain. Early 80s. It was a load of rubbish. Don’t think I ever watched an episode – probably too busy knitting even as a kid – just remember it being on. The pattern that you’ve chosen looks so fun. I’ve never knitted from a sock blank before, so I was surprised to find out that you can get them as double or single knit. I think I’d prefer to unravel the whole sock blank and cake it. I do remember the Dukes of Hazard. 🙂 But I did think “Harry Potter” and thought I missed someone “important” . Great sock patterns, I will be keeping an eye on his patterns. I might be able to knit some, but I am not that good yet. I do plan to knit some more intricate patterns as well some time. 🙂 I will follow your advise and go for it.